Sometimes a game randomly releases and you catch word of it without hearing about it prior. 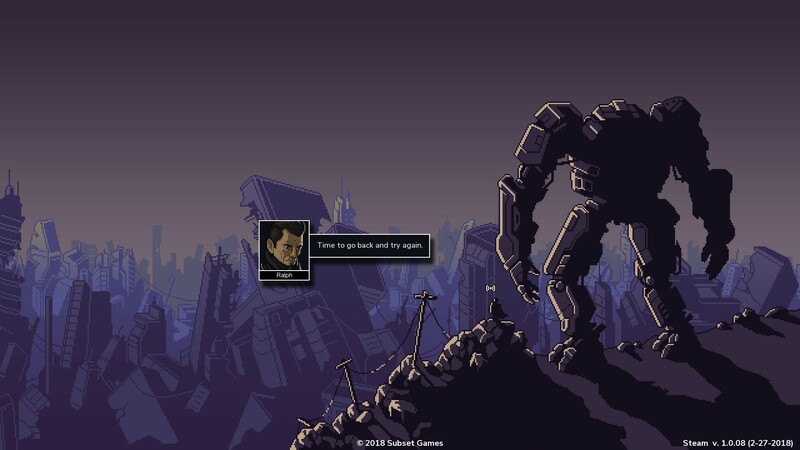 Into the Breach was one of those titles for me, but as the image above states it’s from ‘the makers of FTL’ (Subset Games) and that alone was enough to pique my interest. I added it to my wishlist and was surprised to find that on the same day my Dad randomly gifted it to me (thanks Dad!). 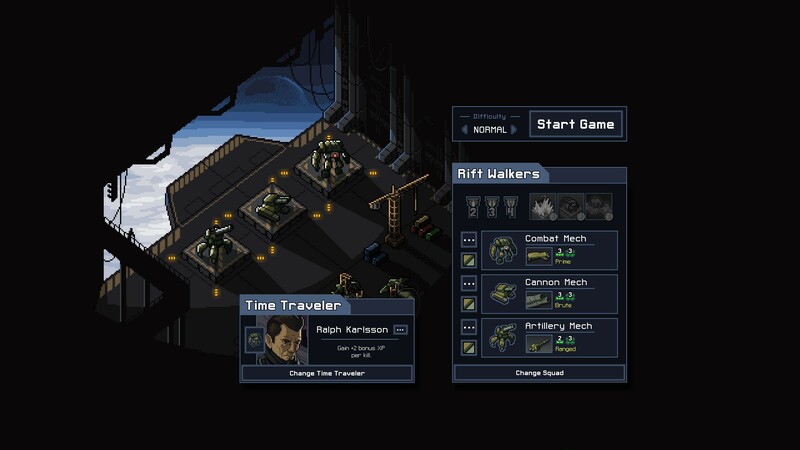 I loved FTL and played the hell out of it a few years back, it really was one of the great “rogue-lite” titles I’ve played and partially responsible for my obsession with the genre. Because the tag has been so overly used as of late, it’s hard to say which sort of randomized content you’ll like but generally I enjoy the genre, its sub-genres and the variety that has spurned from it. 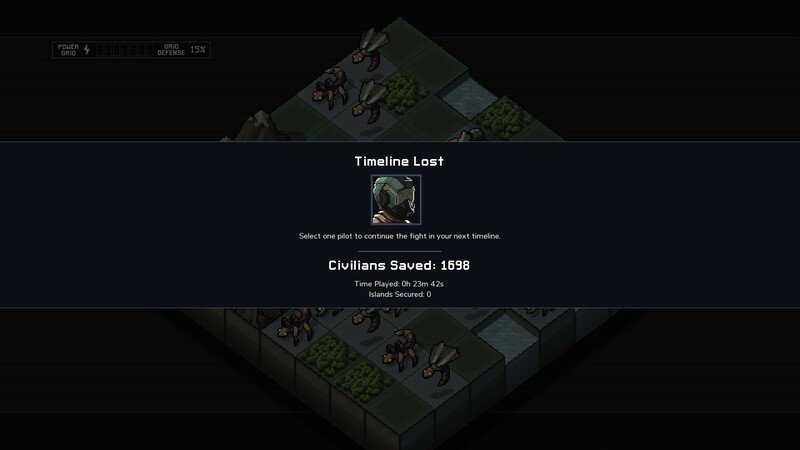 That said this isn’t just FTL with mechs, no. 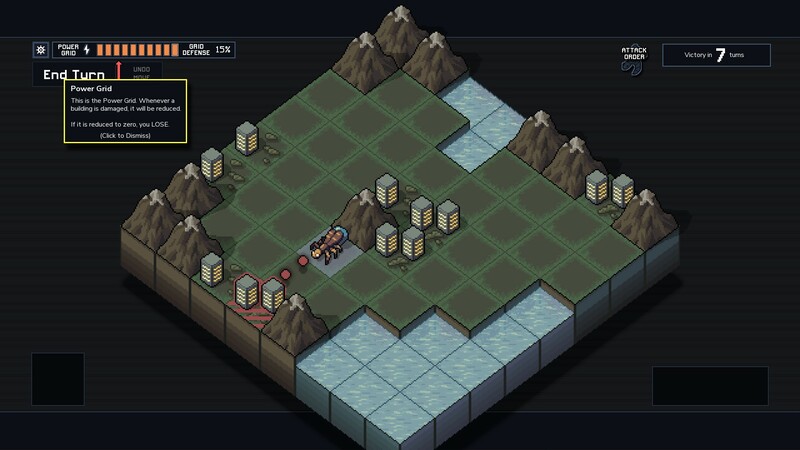 Yes there are mechs, but this is turn based strategy. Tactical turn based strategy to be exact. 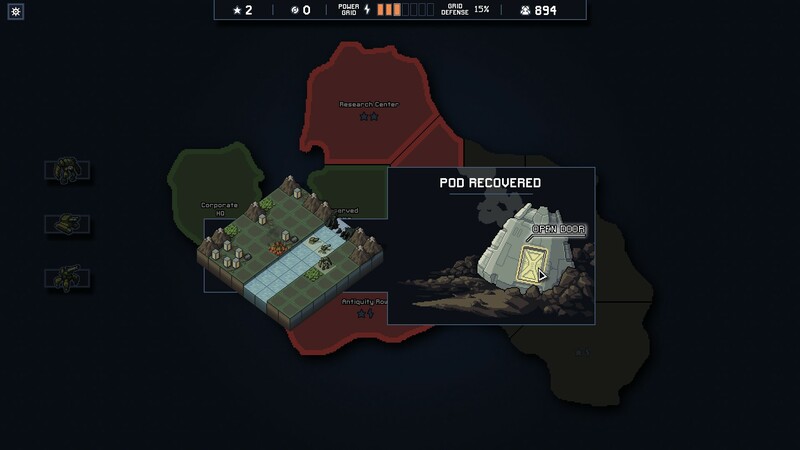 It could be argued that FTL had those sorts of elements, but it wasn’t really a TBS game. I’d say its strength was in its rogue-like randomization making each run different than the last. 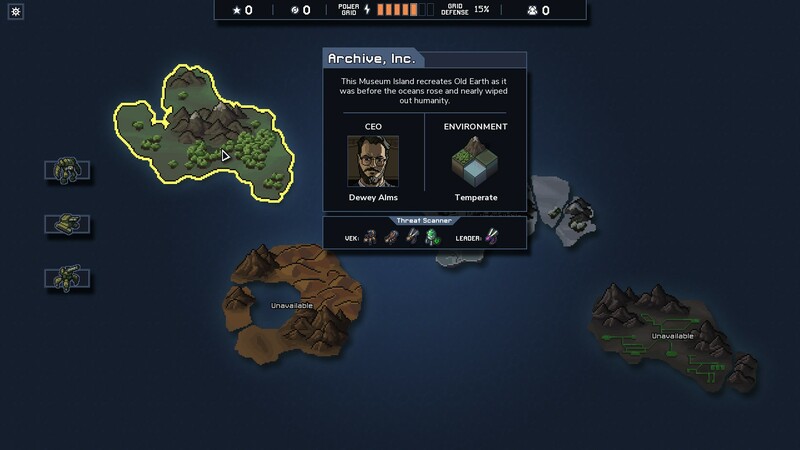 Here, you’ll start the game in your headquarters as a Time Traveler. You’ll have a squad of “Rift Walkers” that are your mechs, each having its own stats and abilities. The starting isle has a training facility where you can learn the ropes. You’ll learn the ins and outs of combat here, and that is the meat and potatoes of the game. Progression seems to come in the form of unlocking other time travelers, color schemes and new teams of mechs to use during your runs. You’ll deploy your mechs on one side of the battlefield, and Vek will emerge from the other. 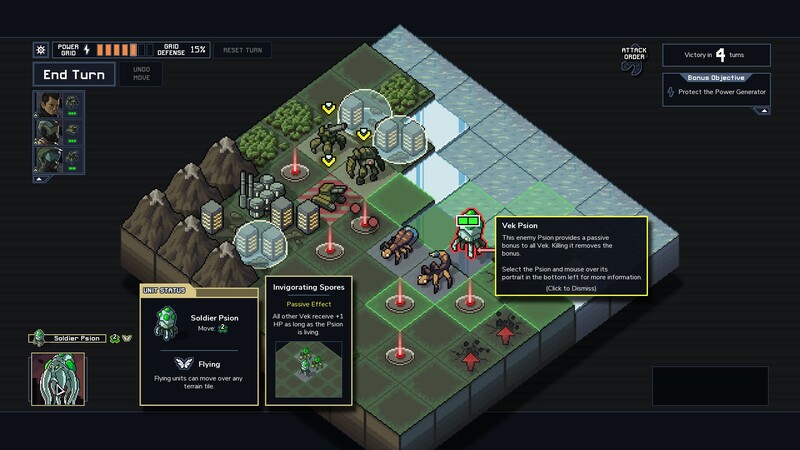 Your goal is to avoid letting the Vek attack the buildings on the map, and they will set up to do so. You can use force to eliminate the targets, or use your abilities to push them away from their intended target, saving your buildings. Each map is set up differently, and perhaps this is randomized (that would make sense). You’ll capture back your territory, chunk by chunk, and some missions will have optional side goals that can be beneficial. Eventually you will lose, but some bits of progression move you towards unlocking better forces and enabling longer runs at the game. I assume at least one of the squads will be locked until you complete a full run. Overall, it’s a great little time waster. I’d recommend it, particularly if you enjoy tactical strategy, especially in bite-sized form. It’s $15 on Steam.